Check out this episode of the suburban aquaponics series to see the addition of a new fish tank. I had one more barrel left from my original Craigslist find and though it would make a perfect addition. I am getting close to the addition of some "real" fish into the system and needed a separate place for them to hang out away from the gold fish. I will be moving the goldfish out the an outdoor setup in the spring but for now they will be staying in the system. I think I have found a good supplier of tilapia at a fair price and I am hoping to get them to breed once established so I will not have to buy them again. This will be an exciting time over the next couple of months! The fish tank is just made from another 55 gallon drum with the top cut off. I have found it easiest to use a circular saw or skill saw to cut the tops off. This gives you an easy guide to follow(the top rim) and gives you the straightest cuts. I have used a reciprocating saw and a jig saw with mixed results so I would recommend the circular saw for the best cut. The bulkhead adapters that I am using are the same ones I have used throughout the system with one exception, I went with 1 1/2" instead of 2" like the rest. I wanted to get a bit more velocity with the solids lifting overflow in the second tank as I will eventually have larger fish with larger food and waste. The smaller piping with the same amount of water being pumped into the tank should give me a faster flow and have more solids lifting power. 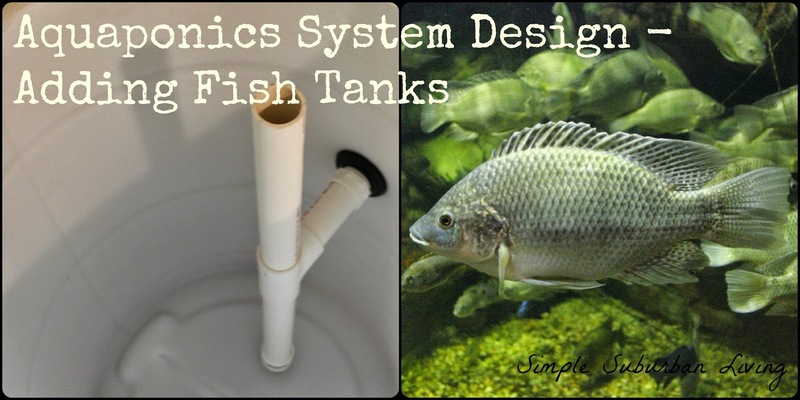 The solids lifting overflow is a standard and common design among aquaponics hobbyists. It consists of a pvc tee with one pipe going tot he bottom of the tank to collect the water and solids and another pipe going to the top of the tank to prevent any siphon from forming if water drains from the system ( a leak). The water outlet in this case just goes to the primary tank and then gets lifting out to the swirl filter. Check out the Simple Suburban Living General Store for products featured in our videos.